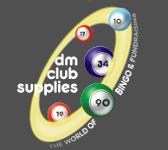 "Many thanks for such superb service, now I know why I have trusted your business for a quite a long time"
"Having used DM Club Supplies for my bingo and fundraising products over the last 6 years I would not go anywhere else. Super company!" "I have dealt with Debbie at DM Club Supplies for many years now for my club supplies. She is pleasant and provides a super service. She always has time fo a chat too!" "Website easy to use, products arrive the next working day"